Peek-a-boo isn’t a baby’s favorite game by chance: after their first birthday, babies begin to understand that even when something isn’t in sight, it still exists. They anticipate that it will reappear—and when it does, they laugh in delight. This charming lift-the-flap book with see-through die cuts encourages little ones to play the game. With its simple rhyming text and pictures of familiar objects and animals, Peek-a-Boo What? helps solidify object permanence. Do you play peek-a-boo with your baby? 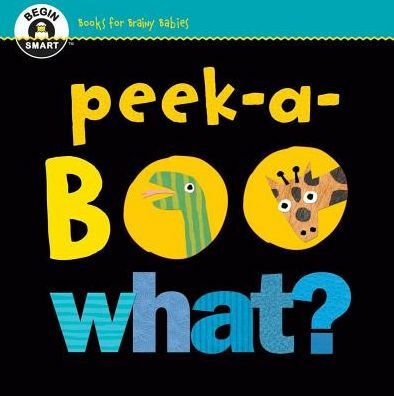 He may love it when you hide behind your hands or another object with a “peek-a…”and then pop out with a “boo!” This book was created to act just like a peek-a-boo game. Unlike other books where you turn page after page, each page in this book folds out for an additional surprise and a wonderful word that rhymes with boo. This marvelous book even has peek-a-boo holes where you can look though to the hidden image. Talk about what you see through those holes. Ask you child what he sees. He will not answer, of course, but asking teaches your child a wonderful part of language — conversation. The holes also make great things for your baby to grip. Don’t ever worry about a baby “hurting” a book. It can always be repaired. Grabbing for the book and putting a book in his mouth is all a part of baby getting to know and love books.